In place of a typical show note that’s written and signed by the house’s Creative Director, Virgil has done it his very own way, by leaving a ‘vocabulary according to Virgil Abloh’ printout on every guest’s seat. It’s one that highlights the A-Z of what’s important and close to his heart, with certain alphabets shining light onto what his debut show for Louis Vuitton was about. And while a number of folks online have criticised the Parisian label’s choice of Abloh as Artistic Director, citing concerns that he isn’t ‘Vuitton enough’, here’s a question. What is truly Louis Vuitton? If you delved back into the label’s history – a luxury trunk and bag maker that aggressively expanded in the late 90s, the truth is, it never had RTW until 1998, when Marc Jacobs was hired to launch the label’s very first show after becoming the Artistic Director in 1997. During his reign, he was controversial in his own ways, reworking the house monograms as he saw fit. Also, Louis Vuitton loves collaborations; Marc Jacobs did it with the likes of Stephen Sprouse and Takashi Murakami for example, while Kim Jones had the Chapman Brothers and Supreme, so is it really a surprise that they went with someone who’s gold when it comes to collaborations? Byredo, Levi’s, Nike, Rimowa and even one now with Murakami himself that just opened in Paris. For a runway collection with just 56 looks, there sure were loads of bags (almost every look had one) that came down the 200 m runway at Palais Royal. Inspired by a white light hitting a prism, the collection started off with a white croc Keepall with added chainlink detail. It’s a classic Louis Vuitton silhouette given Virgil Abloh’s 3% ratio rule, a subtle twist turning a normal object into something special. After white light hits a prism, it comes out a rainbow, and that was exactly Abloh served up, with bags new and reinterpreted galore. The new? Military-inspired belt bags that came with several pocket trunk attachments, giant totes with corners finished with trunk corners. Hard-sided bags in all shapes and sizes featuring what looks like Monogram Empreinte leather. The reinterpreted? 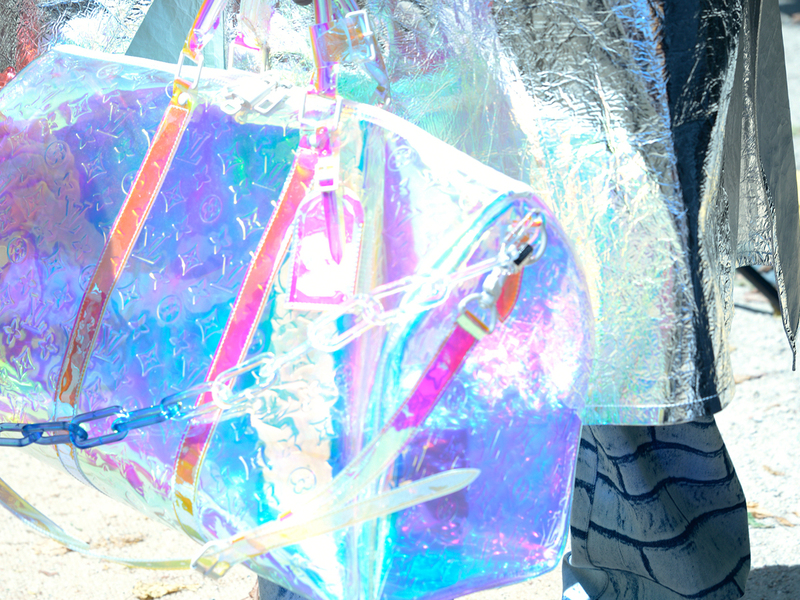 A Papillon that’s now a bum bag/sling, Keepall bags in rainbow holographics, as well as solids in primary colours that look like they are made of thick PVC vinyl. And then there was the Steamer (Abloh made it smaller and more functional) that drew comparisons to that iconic bag from the other famed French luxury house. But before you get on your high horses, the Steamer was originally launched in 1901 over at LV, which pre-dates that icon everyone was comparing it with. Yes, there are countless more, and while you won’t like every single one of them, you’ll definitely want some of them, especially once you get that whole ‘he isn’t Vuitton enough’ nonsense out of your head. Because if you realise by now, it is Louis Vuitton that has constantly evolved to keep up with the times. And Virgil Abloh is exactly who they want now.